When Carnival Fantasy left Mobile yesterday, it had a propulsion issue and passengers were advised they weren't going to be able to call at Cozumel as scheduled. The cruise was becoming a cruise to nowhere and would remain at sea the entire time. Passengers were offered some generous compensation (50% refund and 50% future cruise credit), but quite a few decided to disembark and receive a full refund. It turns out they may have made the wrong decision. Fincantieri moved another step closer to being the largest shareholder in STX France yesterday when they signed the “Head of Terms” agreement with the French government. Another Carnival ship is experiencing propulsion problems, but the folks aboard are on one of those cruises for people who love sea days. Carnival Fantasy was scheduled to leave Mobile at 4pm this afternoon for an Easter cruise to Cozumel, but it remained in port through the early evening as technicians worked on the ship's propulsion system. Majestic Princess was just delivered, and hasn't even yet arrived at its year round home port in China. It was purpose-built for the Chinese market with features aboard that will specifically appeal to the market and lots of other customization they will love. Breaking with previously-announced plans, Princess has just decided, Australians will love them too, and the line announced today that the ship will be based in Sydney for the 2018-2019 Austral summer season (peak there, off-peak in winter China). Carnival broke ground today on their terminal expansion at Long Beach to better accommodate the larger number of passengers that come with the larger ships they will be operating from there. Royal Caribbean confirmed last week they will be investing in the expansion of San Juan's Pan American Pier II to upgrade the facilities in order to homeport Freedom of the Seas there beginning May 12, 2018. The ship is the largest ever to be based in Puerto Rico, although the larger Oasis-class does call there. Freedom will be operating a seven-night eastern Caribbean itinerary from San Juan. 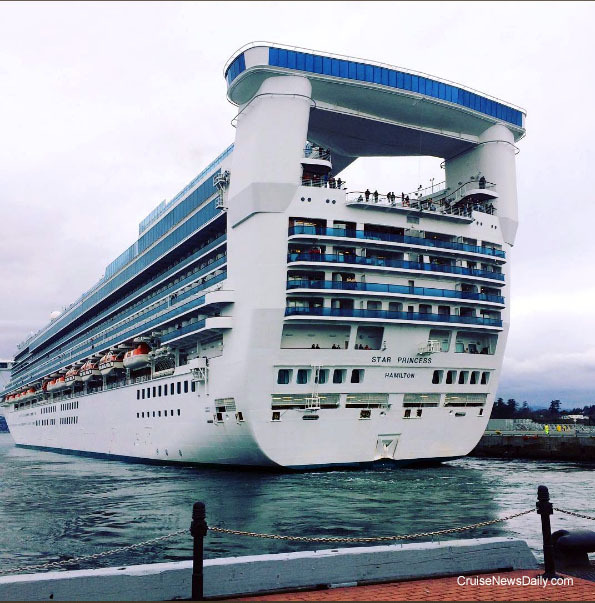 Even though your US taxes aren't even due until next week, the Alaskan cruise season opened yesterday with the arrival of Star Princess at Victoria (BC). Star Princess opened the cruise season at Victoria on April 10, 2017. Photo courtesy of Greater Victoria Harbor Authority. All rights reserved. May not be copied or used without express permission. The shows in the AquaTheater aboard Harmony of the Seas aren't just high-diving and swimming demonstrations. They're, well, fun. Yes, if you look beyond the story, you see incredible feats of high-diving and synchronized swimming, but you also see some cops and robbers in “Hideaway Heist,” which is currently running in the AquaTheater aboard Royal Caribbean's Harmony of the Seas. What were you doing twenty years ago in the late '90's? (Yes, if you were in Sgt Pepper's band he was teaching you to play, but besides that?) If you were Cunard Line, it was the last time you were sailing in Alaska. It's been so long since Cunard sailed in the 49th state that none of their current fleet has ever been there. That's going to change in a couple of years, because in 2019, Cunard is going to return, if only briefly. Queen Elizabeth will be sailing in Alaska as she repositions from Japan to North America. In case it slipped by and you missed it, National Beer Day was last Friday (April 7) in the United States. But that didn't deter the folks at Carnival Australia from celebrating it with an icy glass of Thirsty Frog Summer Ale. The beer is a take off of Carnival's Thirsty Frog Red served in the US, but it was developed in conjunction with The Lord Nelson Brewery in Australia to suit Australian tastes. It's available only on the two ships the Carnival brand has based in Australia, Carnival Spirit and Carnival Legend.